Sometimes we need a little help from our friends, so big thanks are in order for Twitter follower @happymonkeyshoe who helped me identify this cosmic monkey when I sent out a tweet for help recently! I'd spotted him on a market stall in Rome, but hadn't the faintest idea who he might be – thanks Dyl, for introducing me to the world of Captain Simian and the Space Monkeys! The only clue to be found on this 5-inch chunky monkey is a copyright line which reads © 1995 HEI & MPI – which I assume stands for toy distributor Marco Polo Imports – although UK toy designers Bluebird Toys actually created these figures, with Mattel handling US distribution in 1996. As with so many hit toy lines from the 1980s and 90s, the Space Monkeys were conceived alongside the animated television series Captain Simian & the Space Monkeys, a show inspired by the monkey-manned spaceflights of the 1960s and what might have happened if one of those NASA chimpanzee rockets had drifted off course...! Alongside our Captain Charles "Chuck" Simian here, the line also included fellow intergalactic simians Shao Lin, Spydor, Gor-illa/Gor , Dr. Splitz, as well as the show's bad guys Lord Nebula, Rhesus 2 and a selection of vehicles and accessories. Although, the articulation is pretty limited on this figure – knee and elbow joints would have been nice - his hands and feet grip well, allowing him to hold his stunner weapon accessory, and the ball jointed neck allows him to look up and down. He actually stands rather well, with no toppling, in spite of his less than upright posture, whilst his limbs can also be posed to give him more of a monkey gait. His likeness is pretty close to that of his animated character. 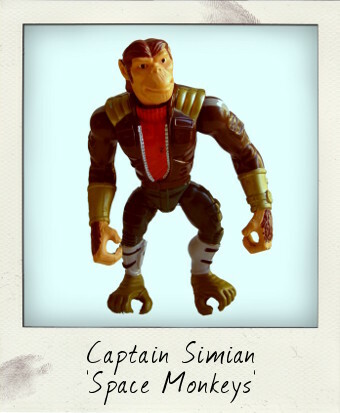 I'm not a collector of carded figures as a general rule, but if you can track down Captain Simian in his original packaging it'll be well worth your while – the figure actually rotates inside the card bubble as if he is floating gravity-free in space! You'll also be able to set him up with all the accessories my Chuck is missing - his Laser Rifle, Stun Gun, and Insta-Vine – even a Space Monkey needs to swing from the trees now and then! What an amazing concept!I would have loved to watch a show like this as a kid!I will definitely keep my eyes out for these.